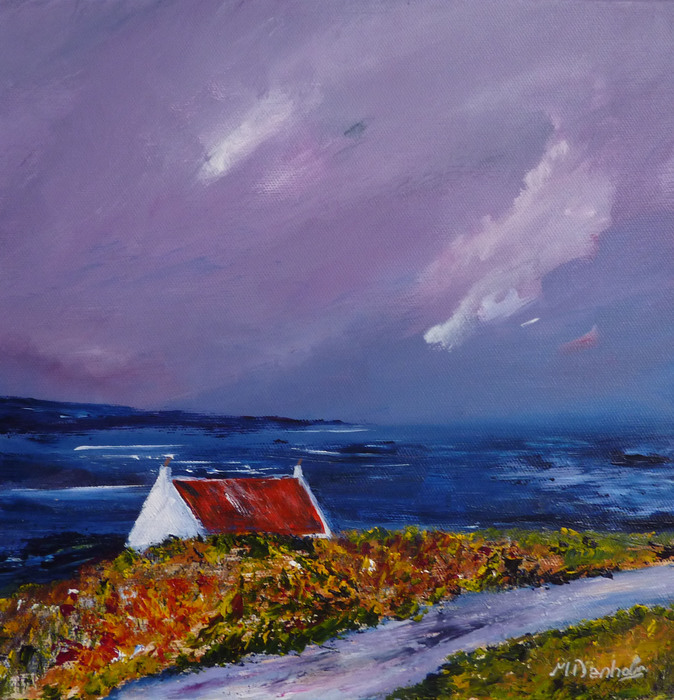 I am a freelance Scottish artist living and working in the Central Belt of Scotland but spending a great deal of time in Argyll and on the West Coast where the ever changing light and weather conditions are a constant source of inspiration for my paintings. Although I paint a wide range of subjects I have a passion for Scotland and the sea, evident in my many contemporary seascapes and landscapes. I work mainly in acrylic which allows me to create texture and use vibrant colour which does not fade with time. 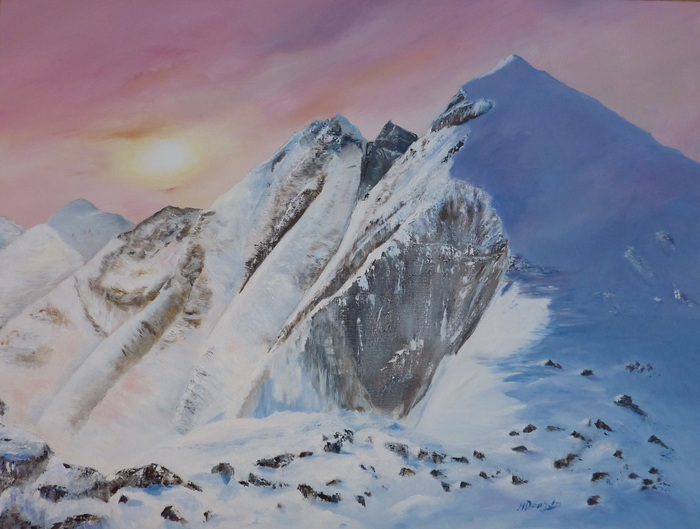 My paintings are exhibited in galleries Scotland and held in private collections in the UK, Australia, USA, Canada, Spain, France and Switzerland. I am also happy to undertake commissions. 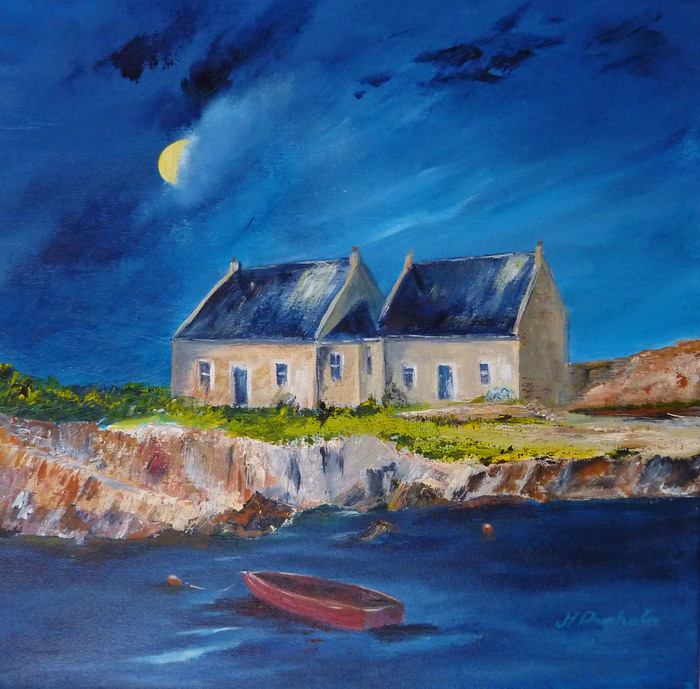 My biggest painting passion - I love Scotland and I love to paint it, never tiring of the beautiful scenery we have here. This painting is very loosely based on a view over Loch Gruinart on the ISle of Islay. The little house is now a ruin. 12" x 12"
One of my largest paintings 40" x 30". An Teallach is a mountain in the north of Scotland overlooking Little Loch Broom. Ailsa Craig, the rock which is midway between Scotland and Ireland has to be one of my favourite views and consequently on of my most painted. This painting is 20" x 8" Click the image for full view. This work is completed on a deep profile canvas with the composition continued on the edges so that the painting may be hung without framing. It is an evening view of a little harbour at Cove, East Lothian. 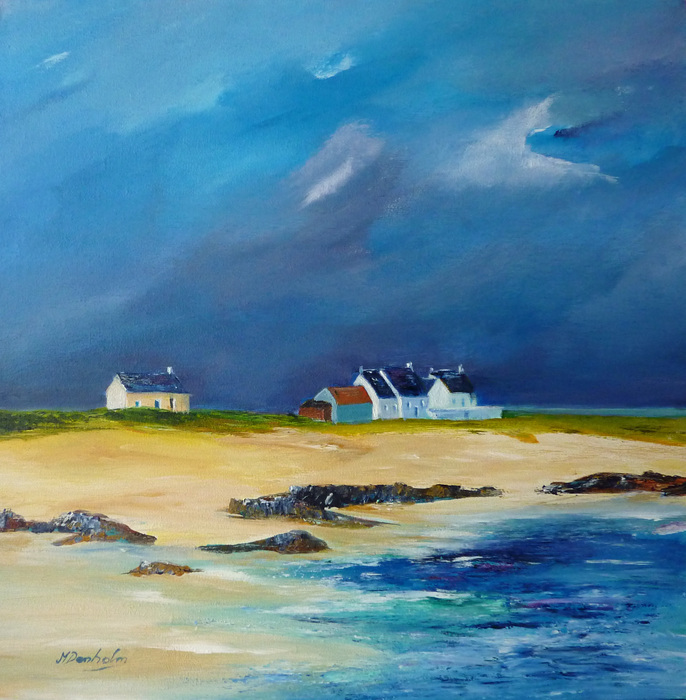 16" x 16" x 1.5"
A deep profile canvas with the composition continued on the edges - a few little cottages on the Isle of Tiree in the Outer Hebrides with a storm looming overhead. 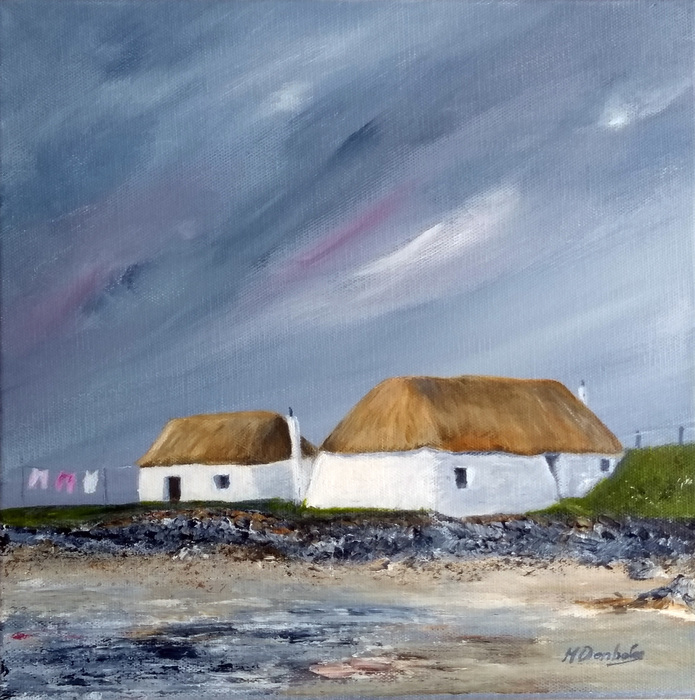 16" x 16" x 1.5"
This work depicts a little lone cottage on a promonotory on the Island of Benbecula in the Outer Hebrides. Painted in vibrant colours it is 24" x 8". Click the image for full view. Preston Mill is an old watermill which dates back to the 16th century although the present building was built in the 18th century. It is depicted here as it is in early spring when the grass is at its greenest. There is a slight wind ruffling the normally flat water of the mill pond and disturbing the little reflections of the conical pantiled kiln roof. 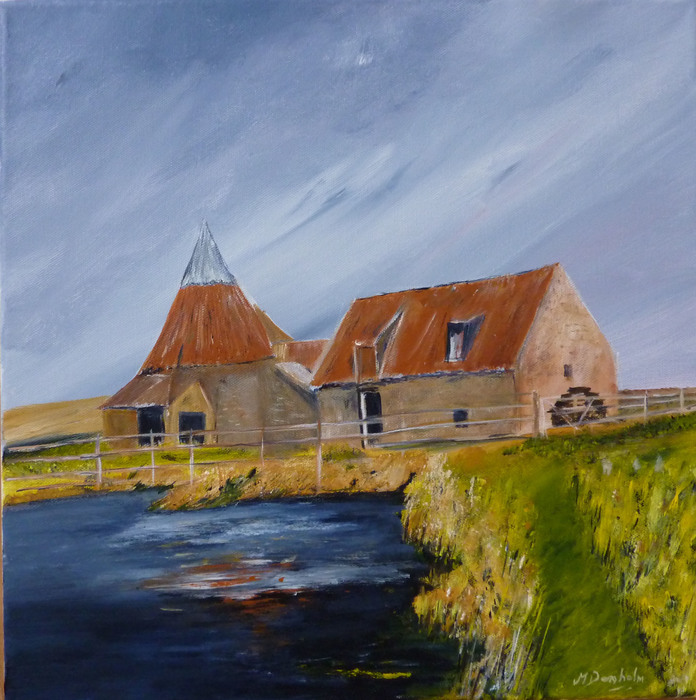 16" x 16"
These little white houses, called black houses, are seen mainly in the Scottish Hebridean islands. Although most of them are now painted white originally they were natural stone. There is some controversy over the name but it is understood that they were called black houses because initially there was no chimney, the smoke just went through the roof, blackening the interior in the process. Here, it can be seen that the one on the right hand side has very thick walls - evident at the entrance to the door. The sky is a light grey streaked with pink tinged clouds and there is a bit of shingle and seaweed at the sea edge. Although there is no-one to be seen there is a sign of occupancy - clothes hanging on the washing line. 12" x 12"